Evaluating a new email service provider (ESP) is tough. No matter how many lists of items you use to evaluate an ESP, no matter how many demos you go through, it’s easy to miss many of the elements that are critical for your specific situation. That’s why trying out an ESP is so important. Is the ESP as bright and shiny as it looks? Oftentimes, the ESP’s salespeople or sales engineers make the system look perfect. A quick walk-through of this feature or that one, and it seems ideal. How could anyone not love it? Then, the sales reps tell you what a great deal they’ll give you if you sign before the end of the month. They capitalize on your excitement, moving you away from the deep technical dive and right into the pricing. Emotions and a false sense of urgency are made to move you forward. You sign for a year, or two, or five—and you’re stuck. For better and for worse, even if the ESP does not live up to the expectations. You may think this example sounds a bit far-fetched, but we have seen it more than once. Although some of the bigger companies may have people with experience to help prevent a mistake in choosing an ESP, many small- or medium-sized businesses have only one or two people managing email-marketing. As a result, there may not be enough hours in the day to spend time on a thorough analysis of potential ESPs. So, out of an urgency to migrate to the new provider, a deal is cut, with the hope that the new platform meets your organization’s email-marketing needs. So, what can you do to ensure that your next ESP choice is the right one? 1. Make a list of the features that are most important for your email-marketing program. This includes things such as getting promotional emails out the door, running A/B split tests, and reviewing metrics of an automated email series. These are examples of some of the most basic features, but there also may be some that are particularly critical for your company’s email-marketing success, such as integration with your CRM, website, or Salesforce Sales Cloud. 2. Create use cases to test. Based on your list of essential features (short or long, depending on how much time you have), create a few specific scenarios to test the ESP. We call these use cases. If you’re creating an email and testing an ESP’s email-building tools, for example, cut up a Photoshop Document (PSD) and create the email from scratch inside the ESP. If integration with CRM software (e.g., Salesforce Sales Cloud, Microsoft Dynamics, Oracle, SAP, Zoho CRM, etc.) is important, go ahead and test out how it really integrates. Look at how the ESP synchronizes data. See how it moves and presents performance metrics (e.g., opens, clicks, unsubscribes, spam complaints) back in the CRM software. Even if you can’t set up an actual environment with full integration as a test, be sure you see exactly how it would work with your CRM. As another example, if you need to create some very specific permissions (e.g., give someone access to see and edit content in one business unit but not another, or give someone access to update one list but not another), make that one of your use cases. 3. Make a short list of ESPs to compare. Before seeing initial demos from vendors, make a comparison checklist of the ESP features most important to your organization, as well as many of the less essential items. Plus, be sure to weigh the features based on importance so you can determine which ESPs belong on your short list. For example, are telephone and chat support key for your brand’s success? Keep in mind that, after seeing a few ESPs, it might not be easy to recall what everyone said and showed to you. ESPs might start looking the same. So, be sure to write down comments, questions, pros and cons, and consider making a video or taking some screenshots for each ESP. This is especially crucial if multiple staff members are doing the evaluation, or if you need to present a business case with a rationale for your recommendations. You likely won’t have enough time to test more than a couple of ESPs, so be sure that your short list makes sense based on your organization’s ESP requirements. In addition, get an estimate of costs while making your short list, because pricing will have an impact on your final ESP choice. 4. Request a fully functional trial of the ESP. A trial may not answer every one of your questions—and it won’t eliminate all risk related to making a good decision—but it’s a good way to reduce your risk by seeing how the ESP can work in your environment with your organization’s requirements. A trial won’t let you fully test how it integrates with everything in your back end—which is important for some businesses—but be sure to have your tech team test the key API calls that would be relevant for your organization’s needs. For example, some ESPs limit the number of calls you can make in a period of time, which could be a deal breaker for an organization. Be aware that some ESPs may discourage fully functional trials, insisting that you go through a pile of training prior to being able to use it. That should tell you something about the usability of the ESP. You should be able to use even the more complex ESPs without extensive training, if the ESP provides some technical guidance during your trial. 5. Give the tool a spin. This is the fun part. Put those use cases to a test. Try each one. This is where you just might uncover what you didn’t see in that ESP demo. You might be even more excited about the tool, or you may uncover some areas that aren’t optimal, given your requirements. Either way, it’s important to know. 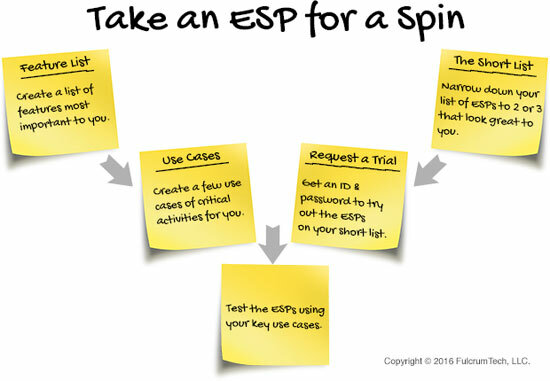 The goal of doing an ESP trial is to reduce your risk of making the wrong decision. It would be great to have your organization’s key production people take part in the trial, as well as the marketing staff (to weigh in on the reporting features). You won’t eliminate all risk with a trial, but it will help you determine where you might need to do things a little differently to get the most out of an ESP. You also may discover some ESP features you can live with and others you can’t live without. If you need help, don’t hesitate to reach out to an email consultant or email-marketing agency. If you’re going to spend tens of thousands of dollars a year on a new ESP, it’s well worth investing a few thousand dollars to reduce the risk of making a decision that you’re not happy about later. Mitch Lapides is founder and CEO of FulcrumTech. Created in 2004 as a dedicated email-marketing agency, FulcrumTech provides email-marketing management and optimization services focused on solid return-on-investment (ROI) improvement, in addition to assisting companies identify, select, and implement new ESPs. Prior to FulcrumTech, Mitch held leadership roles at Reed Elsevier (Executive Vice President, Health Sciences) and Gartner (Chief Technology Officer and Group Vice President, Gartner.com).